Middle Tennessee (3-1) faced off against Louisiana Tech (1-3) Saturday night at Floyd Stadium in the annual Blackout game. The Blue Raiders shined in the second half, storming back for the win 38-34. The Blue Raiders victory was fueled by I’Tavius Mathers career high 164 yards rushing and a near flawless second half performance. Early in the first quarter, Ryan Higgins received a bad snap that went over his head. 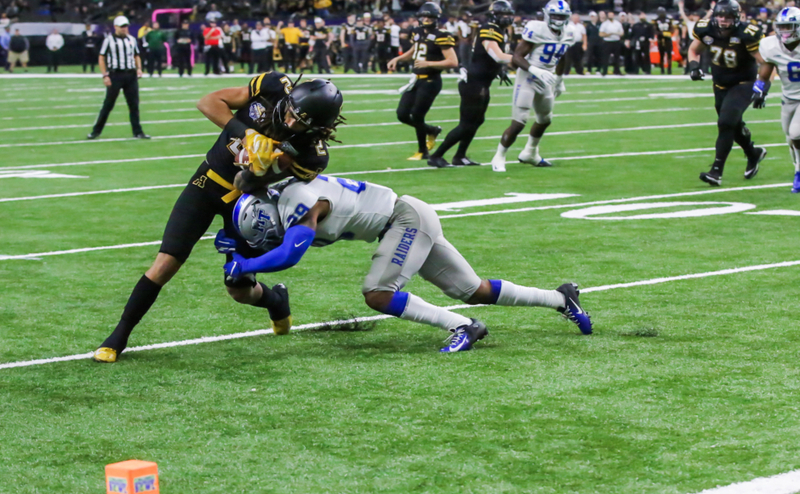 However, he scooped the ball up, rolled out to his right, and found Carlos Henderson who made his way through the Blue Raiders defense for a 70-yard touchdown to put the Bulldogs on the board. Higgins later connected on two explosive plays to Conner Smith and Henderson which set them up on the goal line. The Blue Raiders forced a fumble which was recovered by Michael Minter to prevent another Bulldogs touchdown. The Blue Raiders stalled out of the gate and were forced to put on multiple drives to open up the game. 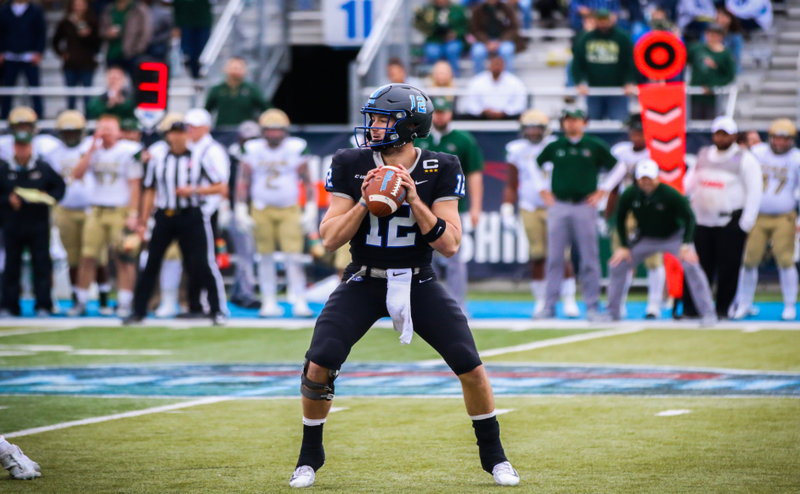 Brent Stockstill struggled to get in a rhythm but finally hit Richie James on a deep pass which setup the Blue Raiders offense in opposing territory. Towards the end of the first quarter, Mathers received a handoff and broke through the Bulldogs defense for a 38 yard touchdown to tie the game at seven. Once again, the Blue Raiders defense held their ground on the goal line and stuffed the Bulldogs. The Bulldogs drive resulted in a field goal to give LA Tech a three point cushion. 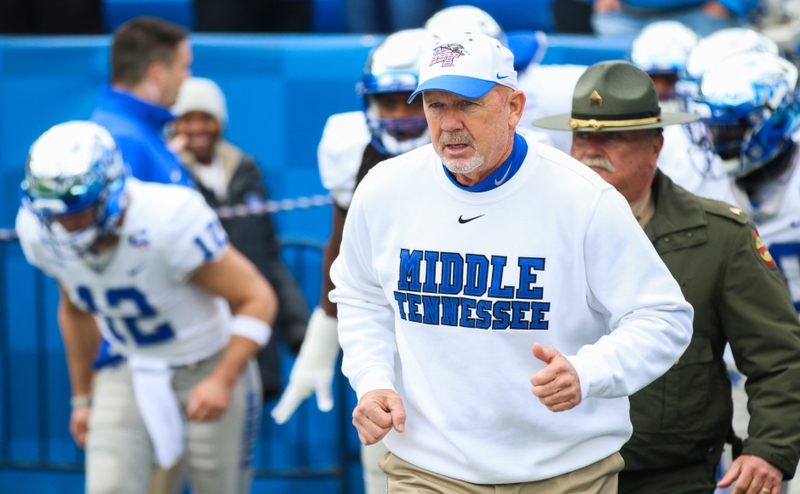 The Blue Raiders were forced to punt yet again halfway through the second but received a friendly bounce to pin the Bulldogs at their own five yard line. However, LA Tech methodically moved the ball down the field but fizzled out just past midfield. The Bulldogs settled for their second field goal to extend their lead, 13-7. Nearing halftime, the Blue Raiders worked their way in scoring distance but failed to convert on fourth down deep into the drive. The Bulldogs took advantage of the Blue Raiders mistake and quickly struck with another touchdown. Higgins hit Trent Taylor in stride as he outran the Blue Raiders defenders and found the end zone. Tech received the ball to begin the second half and their offense didn’t miss a beat. Even when faced with fourth and short, the Bulldogs willed their way to a first down and eventually their third touchdown. Higgins hit Taylor in the end zone for his second touchdown of the game. 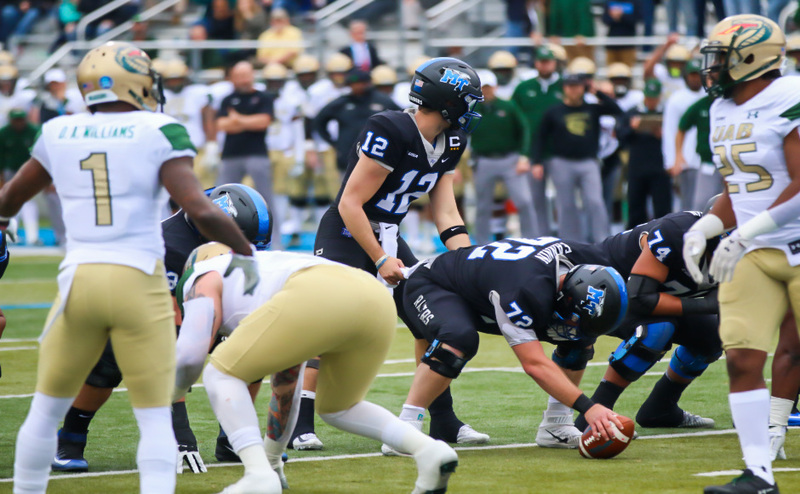 The Blue Raiders had their first chance to score in the second half and seized the opportunity. Stockstill dumped it off to Mathers in the flat who followed his blocks perfectly and streaked down the sideline for Middle’s second touchdown. Momentum was finally on the Blue Raiders side and the defense held the Bulldogs and forced a punt. On the following drive, the Blue Raiders managed to come away with three points to cut the lead to 10. The Blue Raiders played lockdown defense in the second half and stopped the Bulldogs in their tracks, which allowed the offense to narrow the gap even closer. Stockstill dropped a dime to Dennis Andrews and set the Blue Raiders up with a first and goal. On the very next play, Mathers received the handoff and took it up the middle for a MT touchdown. The Blue Raiders only trailed by three, 27-24. The offensive line was a brick wall in the second half. With 10 minutes left in the fourth quarter, Stephen Rhodes sacked Higgins for a big loss leading to a Bulldogs punt. On the ensuing drive, after a helpful pass interference on Louisiana Tech, Mathers powered his way across the goal line with a giant push from the o-line and put the Blue Raiders up for the first time, 31-27. After being held to only one touchdown in the second half, the Bulldogs offense retook the lead with a little less than four minutes to go. Kam McKnight took the ball at the one yard line and put the Bulldogs back on top. Stockstill led his offense down the field in quick response, capped off by a touchdown to Lee who broke three tackles on his way to pay-dirt. “We came back and finished like I had never seen before,” said Stockstill. The Bulldogs still had time remaining to take the lead once more but needed a touchdown to do so, as a field goal wouldn’t tie. In the all important goal line stand, the Blue Raider defense bowed up and Higgins and the Tech offense couldn’t punch it in on four attempts. “They had to score and you don’t get points for yards,” said head coach Rick Stockstill. LA Tech was forced to go for it on fourth down. Higgins threw a fade route in the corner but was broken up by Minter. The Blue Raiders captured their third victory of the season in an epic comeback, 38-34. “We continued to impose our will and never gave up and that’s what makes this win special,” Stockstill continued. Brent Stockstill finished with 356 yards and two touchdowns on 46 attempts and completing 27. James led the team in receiving with 81 yards on five catches and Mathers led the team in rushing with 164 yards on 21 attempts and three touchdowns. The Blue Raiders will travel to battle against North Texas next Saturday. They are hoping momentum will carry over and continue to be on their side when they take the field at 6 p.m. at Apogee Stadium. To contact Sports Editor Connor Ulrey (@connorulrey), email sports@mtsusidelines.com.